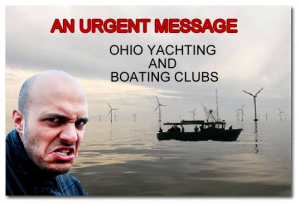 If the people of Ohio do not take immediate steps to defeat the LEEDCo Icebreaker project – Lake Erie will suffer forever the predatory nature of wind developers. The very beginning of this aesthetic travesty is the LEEDCo Icebreaker project. 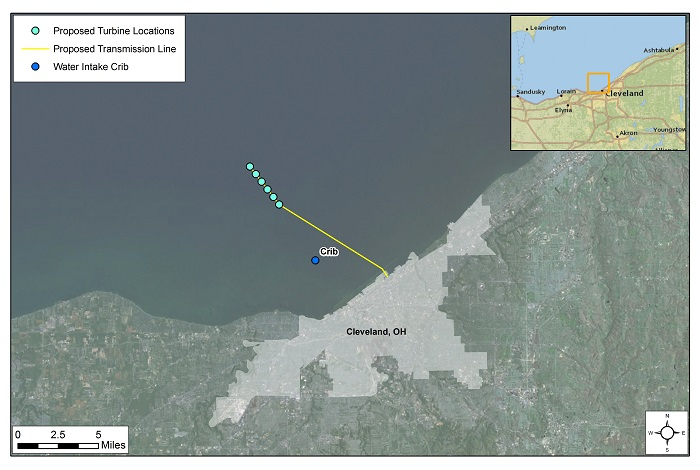 LEEDCo’s web site says they want to have 1000Mw of Lake Erie offshore wind by 2020 – this amounts to over300 offshore wind turbines in Lake Erie on the USA side – and this is just the beginning! Here’s the pro-con dichotomy at work: A 2010 report from the National Renewable Energy Laboratory says that Lake Erie could accommodate enough turbines to power about one-third of Ohio’s more than 5 million homes. To get there, however, the lake would be pockmarked with more than 11,000 of the biggest wind turbines ever made (each of which ascending to nearly the height of the Huntington Bank Building downtown). Given rotor span and overall height, that would take up about half of the lake’s entire area. Read, research and understand what will happen to your Lake Erie seascape if this LEEDCo Icebreaker project is successful. 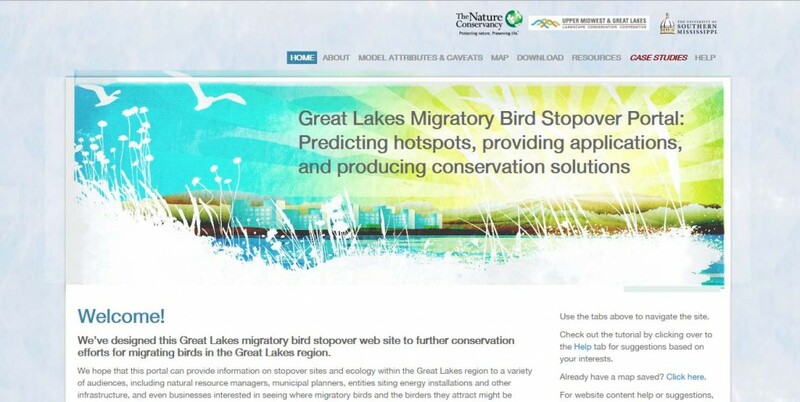 Share this information right now with your neighbors and other Lake Erie riparians. Form a resistance group(s) or organization(s) to fight the Icebreaker project and prevent it from happening. Notify ALL elected officials of your opposition! Identify and contact every elected lakeshore town leader by name and determine his/her position on the Icebreaker project and demand that they take a position opposed to this horrible project. Compile a list of these people and their Icebreaker position and share it with others opposed to offshore wind. Do not let elected officials sit on the fence – take steps to elect them OUT of office if they won’t agree to oppose this project. Pressure the lakeshore town & county governments to pass resolutions against the Icebreaker project. 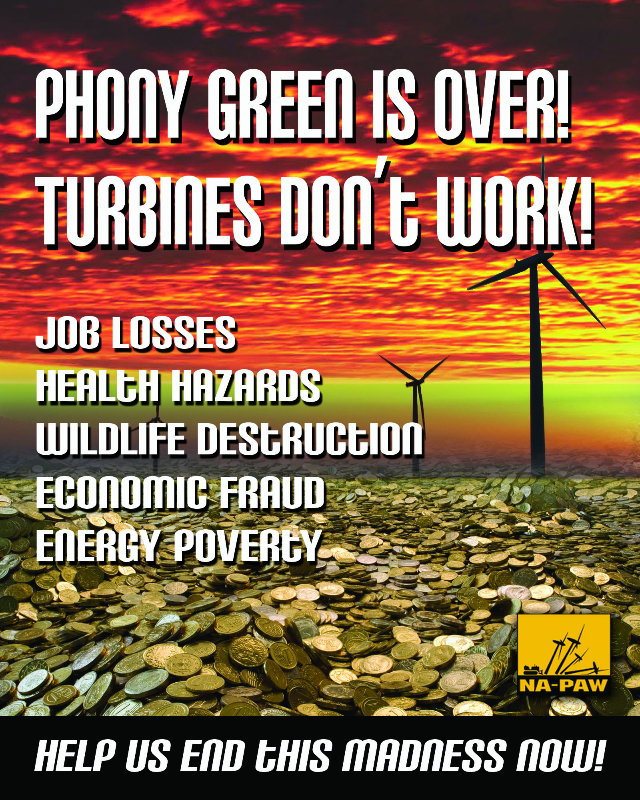 Pressure the Ohio state leaders to pass a moratorium against offshore wind turbines in Lake Erie – just like Ontario did. Make sure new people running for town offices swear they are opposed to the Icebreaker project – try to get this in writing! Identify and contact every county elected lakeshore leader by name and determine their position on the Icebreaker project and demand they oppose it too. Unelect them if they won’t oppose the Icebreaker. Make sure new county office candidates are opposed to the Icebreaker. Demand that each lakeshore county pass a resolution against the Icebreaker project and notify the Ohio governor and DNR of such. Members of all resistance groups should get on the agenda of every town and county meeting to explain your position against offshore wind, provide the town and county with info why offshore wind is a poor approach to energy needs, hand out anti-offshore literature, answer questions, etc. Hire aggressive legal help to challenge every effort to develop this project. 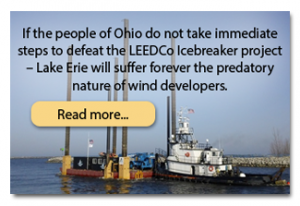 Ohio Democrat U.S. Sen. Sherrod Brown and Ohio Democrat U.S. Rep. Marcy Kaptur both support the Icebreaker project – vote them out! The LEEDCo Icebreaker project is illegal! Ohio has a Public Trust Doctrine (as do most states) and its our belief that the Icebreaker projector any Great Lakes offshore wind project is contrary to the Public Trust Doctrine and this policy will be court tested in the future and defeat the Icebreaker environmental treachery. Keep in mind the Icebreaker is a public/private venture. The waters of Lake Erie and lands underlying them belong to the state as proprietor in trust for the people of the state for the public uses to which they may be adapted, subject to the powers of the United States government, to the public rights of navigation, water commerce and fishery, and to the property rights of littoral owners, including the right to make reasonable use of the waters in front of or flowing past their lands (O.R.C. 1506.10). Ohio’s “public trust doctrine” was originally established in 1803 when Section 14, Article III, of the “Northwest Ordinance” gave the new state authority to regulate activities occurring in navigable waters within state boundaries. The U.S. Supreme Court ruled in Illinois Central Railroad Company v. Illinois 146 US 387 (1892) that the state may not abdicate its control of public trust properties and leave them under private control. Subsequent court decisions have looked with disfavor upon governmental actions that reallocated public uses to those of a select, private party. The Illinois RR case is a landmark law case that is referred to in most any Public Trust Doctrine litigation.